Only the main roads appear on this map, giving the appearance of a rather spacious capital city. The map is covered with a squared grid to allow for the easy calculation of Hackney Cab Fares. 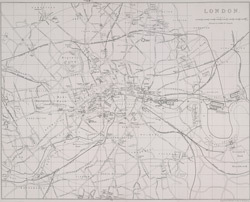 Pecked lines show the intended location of the Thames tunnel. Hungerford Suspension Brigde, as well as East and West India Docks are shown.